Singapore is breaking new temperature records every year, the weather is getting increasingly erratic and the country is punching above its weight when it comes to producing harmful carbon emissions. Yet, while most people here are concerned about the effects of climate change, a significant portion do not believe their actions can make a difference to the country's carbon footprint. The authorities are trying to change this attitude. 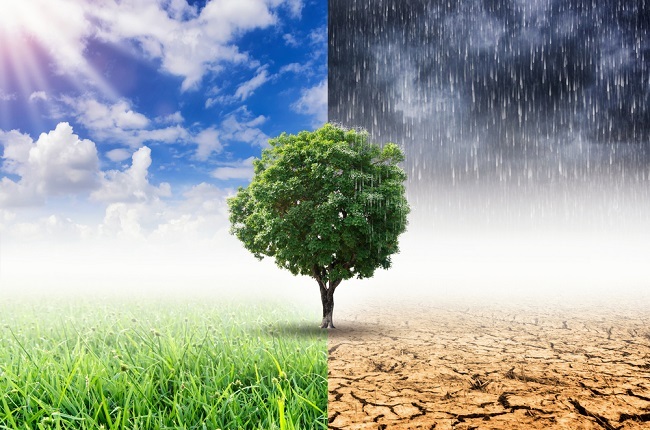 "We feel it is important to raise the level of national consciousness around the need to take individual and collective action to fight climate change," Environment and Water Resources Minister Masagos Zulkifli said yesterday at the launch of Singapore's Year of Climate Action. As part of this effort, people and organisations will, for instance, be able to make a Climate Action Pledge, where they can declare publicly what they want to do to make Singapore greener. Individuals can promise to recycle, take public transport, walk or cycle, while organisations can raise office temperatures by 1 deg C to 2 deg C, for example. More than 210 pledges have been made so far. Singapore may contribute just 0.11 per cent of global emissions, but it ranks 26th out of 142 countries in terms of emissions per capita, according to 2015 data from the International Energy Agency. This means that each person here produces more carbon emissions than his counterpart in Britain, Switzerland or France, for instance. But one in three respondents of a 2016 survey here believes that what he does will not have any impact on this figure. This is even though nine out of 10 were concerned about the effects of climate change on future generations. Disagreeing, Mr Masagos said that tackling climate change cannot be the work of the Government alone. "Taking action individually all adds up... towards making sure that climate change is not as adverse as predicted," Mr Masagos told reporters. 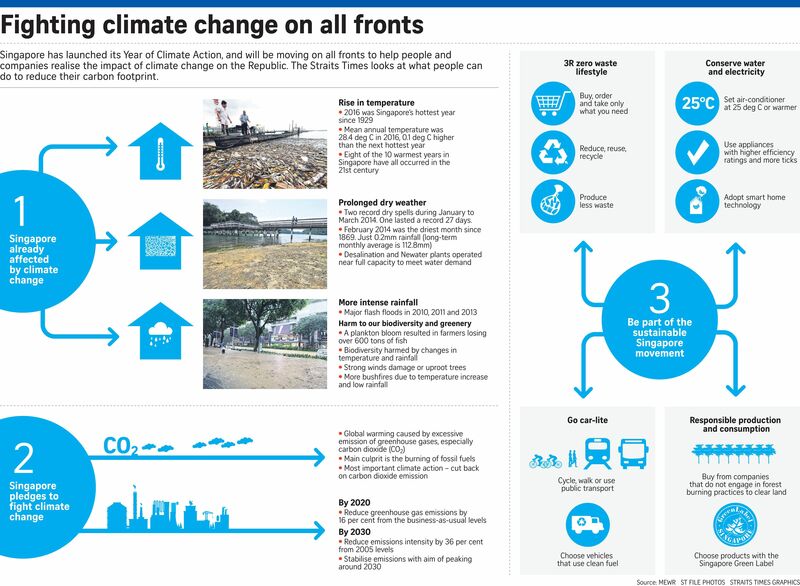 A climate action blog has also been launched at www.climateaction.sg, which will be a resource for those looking for ways to cut their carbon footprint. Asked if his ministry will consider punitive measures for individuals, whether through the implementation of pay-as-you-throw schemes or a plastic bag tax, Mr Masagos would say only that his ministry's focus for this year is the carbon tax, which will be levied on large emitters in 2019. "This is a year when we will join forces with all of you here, plus many other parties across Singapore and beyond, to rally everybody to take action to reduce our carbon footprint and fight climate change," Mr Masagos said yesterday, even as he reaffirmed Singapore's commitment to meeting its targets under the Paris Agreement, an international effort to limit global warming. Singapore will be hosting a Special Asean Ministerial Meeting on Climate Change in July, Mr Masagos said, and this will be an important meeting for Asean to show leadership on climate action. On the ground, there are already encouraging initiatives. The Nature Society (Singapore) is planning to organise activities such as talks and forums to show how climate change affects biodiversity. Environmental scientist Pui Cuifen, 36, is also on a personal campaign to urge marathon or-ganisers to become greener. This includes providing recycling bins along marathon routes to re-cycle cups, and collecting waste from bananas given out at events for composting. Ms Nor Lastrina Hamid, co-founder of the Singapore Youth for Climate Action, said the Government's effort was a good start. "I thought it was good to designate this year as the Year of Climate Action, for some branding and emphasis at the national level. But whether or not the various movements are strategic enough to affect change at a national level - that remains to be seen."